"I didn't have a job for four years because of Israel's blockade. Now I've got more work than I can handle," smiles Musla Embayed a chunky-looking builder, with a vice-like handshake. 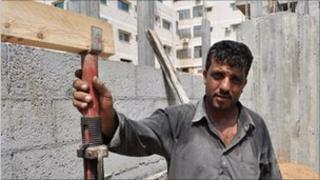 Musla is working on a new block of flats in the centre of Gaza City. He is caked in a thick crust of sweat and dust. It is tough work with the temperature approaching 40C. "There is too much work now," he laughs. Musla is benefitting from a mini-construction boom in the Gaza Strip. On almost every street of the coastal territory's biggest city, you can see some type of building going up or being renovated. The sense of a boom is accentuated by the fact that for so long the need has been so great. Gaza is desperately in need of reconstruction. Decades of conflict, not least Israel's major offensive against the Islamist movement Hamas from December 2008 to January 2009, have left thousands of buildings and homes needing to be rebuilt. Israel's ongoing blockade of Gaza means there are still tight restrictions on construction materials coming legally across the border. Israel is worried, it says, about concrete and cement being using for military purposes by Hamas, which has governed Gaza since 2007. Israel regards Hamas as a terrorist organisation. But this construction boom has its roots not in Israel, but in Egypt. And it is built on illegal smuggling. Parts of Rafah, the southern Gazan town right on the border with Egypt, have the feel of a major industrial zone or port. It is dusty, hot and noisy with the smell of diesel in the air. Hundreds of white tents line the border with Egypt. Under each tent is a tunnel. They are barely hidden. This is not a secret smuggling operation. It is big business, out in the open. Inside one tent, grimy young men are winching up bags of cement, gravel and plaster of Paris. The tunnel shaft is well built. It is about 1.5m (4.9ft) wide, with an electric lift used to bring the goods up from the blackness. "It's about 800m (2,625ft) long," says Abu Khalil who helps run this tunnel. "We bring between 50 and 80 tonnes of material through here every day." Evidence of this is piled up next to us. Hundreds of bags of cement, as well as gas canisters are ready to be loaded onto a huge truck waiting outside. And this is relatively small fry. Back north in Gaza City, I meet Rafik Hassouna who runs one of the biggest construction companies in the Strip. Mr Hassouna does not have a tunnel himself but he buys the materials from merchants once they are in Gaza. "Now I am using around 1,300 tonnes of gravel and cement from the tunnels every week," he says. Mr Hassouna specialises in building roads. Since the upheaval in Egypt earlier this year, he says, the Egyptians are much more lax about smuggling tunnels and have relaxed security. Mr Hassouna adds that Egyptians are also making good money out of it. Omar Shaban, an economist with the Gaza-based think-tank, PalThink, agrees that security on the Egyptian side of the border has been relaxed but he says there are other factors at play. "The whole smuggling process has become more professional, more institutionalised, more sophisticated. It is no longer the work of children. It is the work of sophisticated smuggling groups in Egypt and in Gaza." Mr Shaban says that even groups as far away as China and Dubai are involved in smuggling some goods such as mobile phones. He says they know they have a market in Gaza. But he says construction materials provide the biggest business because of the demand. I put it to him that all this must surely be good for the economy in Gaza, where earlier this year the United Nations estimated that 45% of the work force was unemployed. "It's not 100% good because all of this is illegitimate. This is empowering the black economy. We want to have a transparent and legal economy," he replies. Mr Shaban says the tunnels are creating a mafia-style economy, from which a few people in Gaza are getting very rich. He also says Hamas are making money too because they regulate the tunnel trade. "They benefit in two ways - from imposing taxes and tariffs on everything that comes through, and also through trading directly themselves." For Mr Shaban, this shows the stupidity of Israel's blockade. He says that while the UN is struggling to get building material in legally from Israel for its projects, Hamas can get all it wants through the tunnels and is also profiting. Israel does allow some construction material into Gaza to be used by international organisations. Yigal Palmor, a spokesman for the Israeli foreign ministry, accepts that Hamas is able to get building materials through the tunnels from Egypt, but says this does not change his government's policy. "It's true that a lot of material gets in to Gaza underground and Hamas can lay their hands on that, but it doesn't mean we have to make it easier for them. Hamas is not an organisation that needs to be helped by Israel, certainly not with its current policies," he says. Mr Hassouna would actually rather be buying Israeli cement for his construction company. "It's better quality" he says. "The blockade is hurting the Israeli economy as well as the Gaza economy." "The Israelis could be taking my money instead of the Egyptians," he adds with a wry smile. Meanwhile, Mr Hassouna will keep on building while he can. "We need more and more construction. Four years of blockade means demand is so high," he says.